Rain fights are synonymous with mass hero films, and they are easy tools to send fans into a tizzy. The team-up of nature's fury and the hero's rage is just too hot to handle for us in theaters with whistles and hoots hitting the roof. We list the best such wet fights here featuring our finest leading men..
Kabali special on Superstar Rajinikanth’s birthday! Superstar Rajinikanth’s Kabali is a mystery! Breaking - What is happening with Enthiran 2? This page hosts a weekly slideshow related to Tamil movies. Each slide includes a picture and some description about that picture. All the slides will have a recurring theme. People looking for actress stills, actress images, actor stills, actor images, movie stills, movie images, and other interesting topics, relevant issues in Tamil cinema will find this page useful. 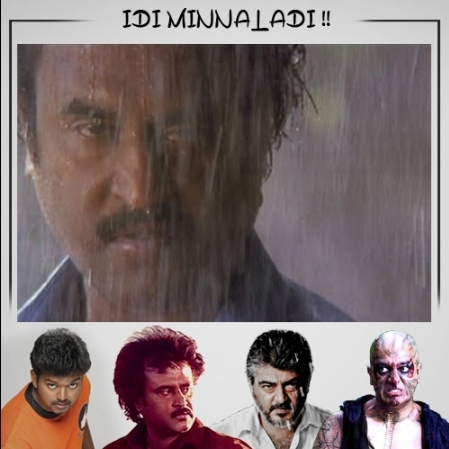 Rajinikanth - Thalapathi | Idi Minnal Adi.